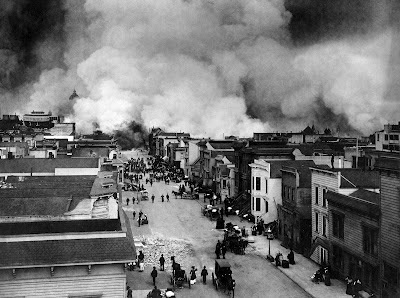 San Francisco Mission District burning in the aftermath of the San Francisco Earthquake of 1906. One important aspect of an earthquake sequence is the clustering of earthquakes within an area in a duration of time. This is observed in both small scale and global levels. Earthquake swarms or clusters are events where a local area experiences sequences of many earthquakes striking in a relatively short period of time. Most earthquakes, except possibly the strongest ones, come in clusters. Earhquakes consists of one main shock and the resulting aftershocks, there are even events of multiple earthquakes clustered so densely that they are considered as a single event. The phenomena of clustering has been garnering attention due to the recent spate of earthquakes in the last decade. It has increased recently when it was noticed that unusually large clusters of earthquakes often occur after a strong earthquake. However, the mechanism of clustering is not clear and presents an important problem due to its intrinsic connection with one of the unexplained fundamental features of earthquakes-their interaction with each other over wide distances and time intervals. Are large earthquakes linked across the globe? The past decade has been plagued with what seems to be a cluster of large earthquakes, with massive quakes striking Sumatra, Chile, Haiti and Japan since 2004. Some researchers have suggested that this cluster has occurred because the earthquakes may be "communicating" across large distances, possibly triggering each other. But a new analysis by Tom Parsons and Eric Geist of the US Geological Survey concludes that the cluster could just as well be the result of random chance. Each of the devastating quakes in the 2000s drew huge media coverage and required extensive rebuilding and economic restoration. The intense interest in the earthquakes has led some to wonder if we are living in the middle of an "age of great quakes," similar to a global cluster of quakes in the 1960s. It's important to know whether these clusters occur because big earthquakes trigger others across the world, Parsons and Geist say, in order to predict whether more severely destructive quakes might be on the way. To determine if the quake clusters in the 1960s and 2000s could be attributed to random chance, the researchers looked at the timing between the world's largest earthquakes--magnitude 8.3 and above--at one-year intervals during the past 100 years. They compared simulated lists of large quakes and the list of real quakes during this time with the between-quake intervals expected from a random process. The intervals between the real-life large quakes are similar to what would be expected from a random process, they found. In other words, the global hazard of large earthquakes is constant in time. Except in the case of local aftershocks, the probability of a new large quake occurring isn't related to past global quakes. This could be disappointing news for researchers who thought global communication between quakes might offer a way to predict the most severe seismic activity. But there also may be some good news after a decade of destruction. If global great earthquakes are occurring at random, the authors say, then a specific number of quakes that cluster together within a short time is unlikely to be repeated in a similar way over a 100-year span.